The Thames Rig Triloboat, continued. The world around, any period in history, if you have a lot of cargo to move, a flat-bottom hull is the answer. With it you have efficient use of interior space, high stability, and the ability to beach your craft most anywhere. On Northeastern US inland waterways in particular, flat-bottom workboats used to be ubiquitous. And now they are almost entirely gone, gone to the point where very few people in my area have much knowledge about building or sailing them outside of a museum context. So this lack is what our project is up against in trying to build an effective sail-powered cargo vessel on a tiny budget. I still think Dave Zeiger has nailed it when it comes to the hull. 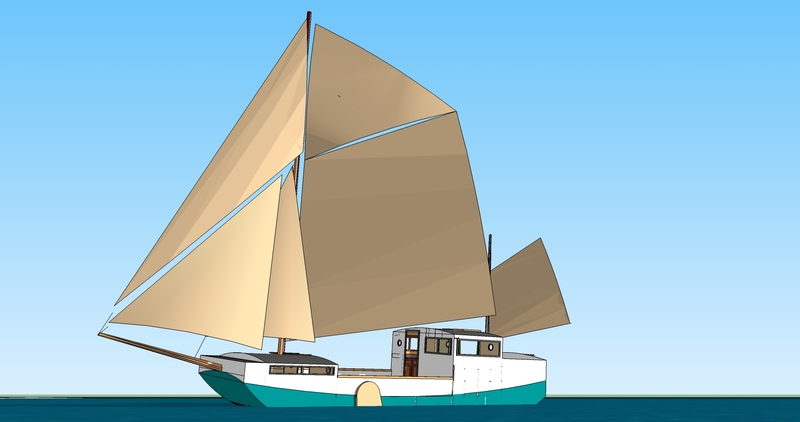 Strong, cheap, and easy to build, the “triloboat” hull is also close enough to historic working flatboats in shape that we can easily mix and match features of superstructure and rig. Although the hull of a San Francisco Bay scow schooner, a Thames sailing barge, and a Chinese Junk are all basically flat bottom barge hulls, the rigs (sails and masts) they carry are fairly different. It is likely that several rigs could lend themselves to our chosen route and the skill of our crew. Wow, here is a lot of great insight on a working boat that used to be common as dirt on the Thames–virtually the equivalent of the semi truck back in its day. The Thames barges come pretty large–up to 80 feet–and have many design features required by our route. First, it can lie quite close to the wind for a flat-bottom boat — 55 degrees. Second, the masts can be easily lowered to go under bridges (The bridges on the Champlain Canal allow for 18′ of clearance). And lastly, the sprit on the mainmast serves as a super crane, with plenty of strength and reach to swing a pallet of rice to the dock. It’s also designed to be handled by a small crew (usually two, in the case of historical Thames barges). So here is an interesting rig that we can’t rule out. Once our hull is built next year, I hope we will have plenty of time on the lake to experiment with multiple rigs. Here you can get another view of the construction and interior arrangements of theT32x10. This is of course still a draft and subject to a a lot of consultation and revision. The boat is reinforced with bulkheads every 8 feet of length at minimum. This results in several separate watertight compartments. 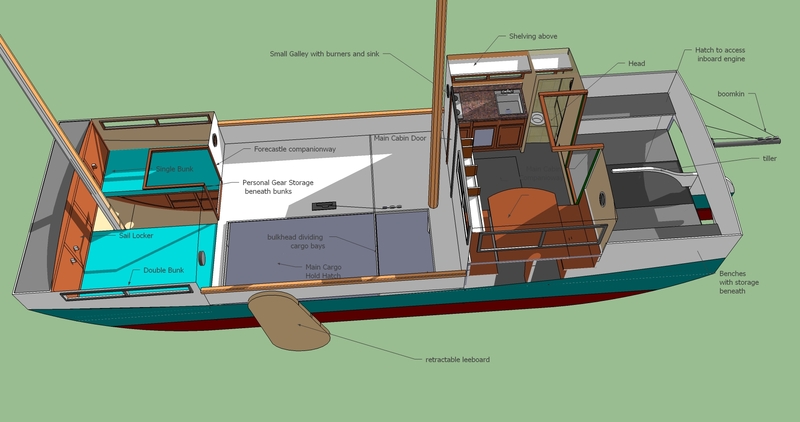 Each creates a separate “hold.” The foremost, in the forecastle sleeping area, has only storage for the crew’s personal gear and possibly for sails and tackle in a locker. The main deck has hatches to the two primary cargo hold compartments. The hold beneath the floor of the main cabin has additional cargo capacity. It’s expected that the aft hold beneath the poop deck will be used mostly for the auxiliary motor and other mechanical systems. Overall, the boat is 32 feet in length and 10 feet in beam. The main holds are 2’6″deep x 10′ wide x 12′ long, both combined. A boom rigged from the mainmast can hoist heavy items or pallets and swing them to an adjacent dock. Clicking on the picture gives you a better view of the labels and particulars. I think that the boat would be a very pleasant home afloat for the working crew, especially when you consider that the frequent dockings the plan entails will also provide opportunities to mooch showers off of friends and buy fresh food and drink on shore. The most eminently practical and cost effective design I’ve come across is the T32 as designed by Dave Zeiger of Alaska. I’ve rendered a 10′ wide one (T32x10) in these pictures. Constructing the vessel will likely be the easy part of this project. The harder part is building the network and solving the various logistical puzzles to ensure a smooth launch of the model. Not to mention the software components I have in mind for the sales platform, which are rather out of this farmer’s depth. Various plans to build it next year are under discussion, including building it at my farm and also possibly at a school. The beauty of this design is that it can be transported on a mobile home trailer quite easily and thus stored on the farm inexpensively when not in use.